So it's a medical opinion. It has to be given within probabilities, not possibilities. THE COURT: Any opinions have to be given with that. All right. uterine rupture. 59. The trial court erred in prohibiting plaintiff from cross-examining Dr. Socol about his admission on deposition that the issue about care of plaintiff was the last hour of care. MR. QUANDT: Your Honor, if I could add to that, Ms. Periolat was not in chambers. Mr. Geraci indicated that we were talking about issues, the issues in this case. He said, well, Dr. Socol is going to tell us on cross today what the real issue is, because in his deposition he said: I think this is the issue. All I'm saying, your Honor, here is the issue is going come from the Court, not from the witness on the stand. 60. The trial court erred in failing to strike the testimony of defendant nurse expert Kathryn Cavanaugh, who failed to qualify as an expert. This would have given plaintiff a directed verdict on nursing violations of standard of care. THE COURT: This is another motion to strike the testimony of Kathryn Cavanaugh; right? MR. MERCHANT: Yes, your Honor. This is -- with all due respect to Counsel, this is another example of inaccuracy by Counsel because right here on Page 42 she says she spent 60 percent of her time administratively. She has said that. Then she gave a long and detailed explanation of how 40 percent of her income is from expert witnesses, but I think she shot herself in the foot on that one. She was only able to talk about two incidents where she had any contact with a patient on a labor and delivery floor in the last 20 years; and one of them she was called down there because it was a crash, and she is the person that they call whenever there is anything horrible going on. The other thing is that when we're looking at that section of the statute, it doesn't -- when it says 75 percent of her time or his time in the field, it doesn't say how they're to allot that time in the field. It doesn't say that 75 percent of the time actually has to be, for purposes of this case, in a delivery room actually delivering babies, in an operating room, in a labor and delivery room. It gives no guidance as to that. I think that the statute here is -- I mean, it's obviously a statute that has to be followed. I think this witness' testimony was sufficient to meet the requirements of the statute, and I'm going to deny the motion to strike. 61. The trial court erred by sustaining defendant's objection and cutting off questioning about Dr. Socol's long history of testifying as an expert witness. That goes to bias and prejudice and is proper cross. Q You've acted as an expert in prior cases other than this? Q The first time was about 1981? Q And in April of '03 you looked at three or four cases during that time period as an expert? A I'm not sure I understand that. Is that I looked at three or four cases over 20-some years? 62. The trial court erred interposing defendant's objection to a question about defendant Socol's knowledge and prior expert testimony about fundal pressure, saying “whoa whoa whoa”, and interrupting plaintiff's cross examination once again by dismissing the jury and then sustaining the objection and prohibiting further cross on that subject. The trial court mixed up cross examination with impeachment by a prior inconsistent statement. Q Isn't it true, Doctor, that you know exactly how to apply fundal pressure, and you yourself have in the distant past testified as an expert on how to apply fundal pressure? MR. QUANDT: Objection as to relevancy, your Honor. Are we talking about this kind of case? THE COURT: Whoa, whoa, whoa, whoa. Jury, go inside of the jury room. The witness step out into the back. Let's see what we're talking about here. THE COURT: All right. What are we talking about here? MR. GERACI: The witness is old enough to know about fundal pressure. He's seen fundal pressure applied. THE COURT: That's not the question. I know all that stuff. That is not the question you just asked. Read the last question back. THE COURT: That's the question. How is that relevant to this? MR. GERACI: It shows his knowledge of fundal pressure. MR. MERCHANT: He has defended two doctors who applied fundal pressure, and he said it was the standard of care. THE COURT: -- whoa, whoa. When I say, “Whoa,” that means you keep quiet, unless you haven't figured that out yet. Okay? THE COURT: Now, how is that remotely relevant to the issues as to whether fundal pressure was applied here? He said it was okay in the past, so now he's doing it here? MR. GERACI: No. He's the only person in the room, your Honor, that would even know what fundal pressure was or has even had it applied. THE COURT: That is an inaccurate statement. It couldn't be more inaccurate. Everyone in this room now knows what fundal pressure is. I could tell you what fundal pressure is. I never went to med school. I never took physics. I never got beyond chemistry. I can tell you now what fundal pressure is. We all know what fundal pressure is. That's all we've heard for the last two weeks. That is not an accurate statement, so don't say that. I'm really getting sick of those statements. Now, what relevancy is there in this case to the fact that this gentleman on prior occasions has given testimony in favor of fundal pressure? His prior testimony as an expert witness is only relevant if it somehow impeaches what he said in this case, and you just can't keep on saying: You've been an expert, you've been an expert, you've been an expert, making it appear to this jury as if he has taken all those contrary positions without tying that up. That is improper, and it leads to a mistrial. If you're going to do that -- the next time you do that, you better have a transcript ready to show the witness where he said something different on a prior occasion. Okay? 63. The trial court erred by losing his temper and yelling at plaintiff counsel in the presence of the jury. In its rush to keep to the court's self imposed trial schedule and close the case on Friday afternoon, the court became impatient and the jury could hear him yelling. These repeated lapses in judicial demeanor were all directed at one or another of plaintiffs' counsel and never at any one of 4 defense counsel, and seemed to increase after defendants' solo interview with the court, initiated by the trial court about “settlement” after cross-examination of Dr. Chan and defendants' controlled and expert witnesses may have made it clear to the court that the case was not going favorable to defendants and settlement should be explored. MR. GERACI: Your Honor, I wish to make a note for the record that your Honor is raising his voice. The jury is 10 feet away. THE COURT: I'm happy you are doing that. MR. GERACI: This is the second time that your Honor has raised his voice in anger within earshot of the jury. THE COURT: It's at least the second time, and it's not the only time I have been angry. MR. GERACI: Your Honor, he gave it to me. He gave me this transcript. THE COURT: I'm done. I'm done. If that happens it happens. Then I'm moving on to another job. I'm going to go work in the Social Security Administration. Bring them in. Let's see if they are ready. Q At what -- do you know, at what point does a physician enlist the help of nurses who are present to apply pressure on the fundus? THE COURT: Sustained. Let's move on. Plaintiff had numerous other depositions & trial testimony of Dr. Socol involving fundal pressure and rupture of the uterus. Ex A. The trial court interfered with the cross exam on the final day of trial, the most important cross-examination of the main defendant. As can be seen by Exhibit A, Dr. Socol testified as the defense expert in a very similar case where the uterus ruptured after variable decelerations appeared. Bolduan v. Highland Park Hospital 19th Judicial District 95 L 403 Had the trial court not been yelling at plaintiff counsel, interfering with this line of questioning, anxious to truncate the trial to send the jury out on Friday afternoon, much of Dr. Socol's direct testimony, and denials of knowledge of fundal pressure would have been shown to be false. Dr. Socol's counsel knew this, since he had provided these depositions to plaintiffs in discovery. It would have been shown that Dr. Socol had lied on the witness stand, and he would have been discredited. 65. The trial court erred by sustaining defendant's objection to re-cross examination of Dr. Socol about Dr. Socol's decision-making process while watching the heart rate fluctuate and not moving to a c-section. Q You didn't have in your mind the idea that second stage patterns like this can lull one into a false sense of complacency because in most cases they resolve and you have a normal birth? MR. QUANDT: Objection, your Honor. 66. The trial court properly denied defendants' motion for a directed verdict, but then reversed itself and granted the motion, and then ruled that no deviation from the standard of nursing care, or obstetrical care, could be argued at closing argument, and that no instruction on issues would be given except for the sole issue of fundal pressure, and refused to give Plaintiffs' Instruction no. 8. MR. ARREOLA: What are the issues again there? THE COURT: There's no issues. MR. QUANDT: Applying or causing fundal pressure to be applied rupturing Hilaria's uterus. That's the issue. MR. GERACI: Applying or causing? MR. QUANDT: Fundal pressure to be applied rupturing Hilaria's uterus. MR. GERACI: Nothing about the nurses' duty to advocate for the patient if they see it? The trial court erred in excluding any argument on anything but fundal pressure. This is inexplicable given the denial of the motion for directed verdict and then the court's immediate reversal of itself. Just so the record is clear, you've asked me to do it; and no one has objected, so I'll do it. You would be precluded from arguing that the failure to do a C-section at any time between 5:00 o'clock -- at any time prior to the time the C-section was done was a proximate cause of the mother's and the baby's injuries. What the court did was basically grant the motion for directed verdict it had just denied by limiting the issues exactly as defendants had argued, and the court denied, in their motion for directed verdict. MS. KOCOUR: We do have a motion for directed verdict in that the plaintiff failed to prove a prima facie case through his experts both on the nursing issues and on the physician issues. The basis of it, Judge, is that while the experts testified that there was injury before the rupture, they never linked that injury to the HIE that was indicated by the testimony existed after the rupture. They never stated that any injury before the rupture was permanent in any respect. MS. PERIOLAT: My motion is plaintiff did fail to establish a prima facie case much in the way Ms. Kocour described. Dr. Gatewood was their own expert as to Dr. Socol. Under Wolinsky you can't just as well testify to deviations as to this. The expert has to establish that he's familiar with the standard of care, what the standard of care is and how the individual defendant doctor. Dr. Socol, deviated from that standard. They then have to proximally cause an injury. I don't believe Dr. Gatewood's testimony got them there on any of those. THE COURT: Not even on fundal pressure? MS. PERIOLAT: With regard to fundal pressure, I believe Dr. Gatewood -- again, I don't think he satisfied Wolinsky in terms of satisfying that he was familiar with the standard, that this is what the standard was, et cetera. So under that, no. MS. PERIOLAT: I think -- no. My motion at the end of the plaintiffs' case was he failed to satisfy Wolinsky on all the burdens. Okay. MS. KOCOUR: What I think he may be saying is condition versus cause. THE COURT: That's kind of what I thought, too. MR. HELMS: I think that issue has disappeared because the case hasn't been presented that way. THE COURT: Don't you think that it's encompassed within Dr. Gatewood's testimony when he says -- I mean, I'm just going from my notes. 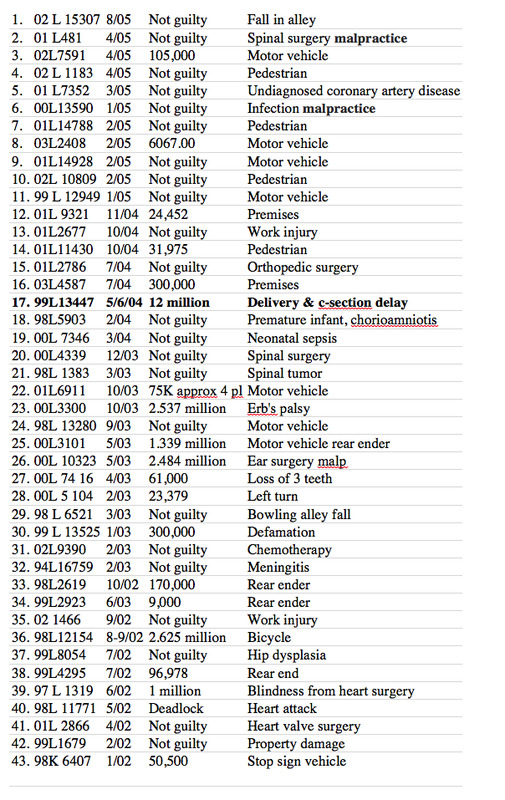 That's not the official record, but he says he went through a summary of Plaintiffs' 13 of all of the deviations of the nursing standard of care, and then he said: I'm of the opinion that all of these were proximate causes of the injuries to Hilaria and Giselle. MS. KOCOUR: That's as specific as it ever got. THE COURT: It gets more specific, but it kind of moves away from that. I'm not saying that it was articulated as well as maybe it should have been, but isn't there sufficient evidence in the record to make that argument? MR. QUANDT: Not as to Dr. Socol, not as to Dr. Chan. MR. QUANDT: He's tying the -- he did not tie up physician deviations. That's what he did not do, your Honor. MR. MERCHANT: He did. We went through each of the deviations. MS. KOCOUR: He never testified to HIE. THE COURT: I think that may be a problem. What about the theory if he said -- Gatewood said: I believe this baby should have been delivered between 5:00 -- sometime between as early as 5:00 and as late as 6:15? If the baby is delivered that early, none of this happens? MR. HELMS: That's Pfaltzgraff, an old case from law school. THE COURT: At the directed verdict stage, do I have the authority to . rule in your favor on this issue given that? 1. All the nursing deviations of standard of care after 4:00 pm. identified by Plaintiff's expert Dr. Mahlmeister were proximate causes of injury. For Mr. Helms to say that the only deviation supported by the testimony was fundal pressure and the only reason the baby was still in utero until it was dead and lifeless was application of fundal pressure, is a direct and deliberate false statement of the case. MR. HELMS: I think we need to know whether it's going to be an issue in the case or not. It's only going to become an issue if Mr. Geraci tries to argue the case that way. If he says he's going to, then we have to grapple with this. If he does, it's never been presented that way. I'd argue, first of all, that he shouldn't be allowed to argue it because the evidence hasn't even supported it. No one has ever said that the only reason they were around -- the baby was still in utero for this untoward calamity was that they should have sectioned earlier. Rather, they have chosen to say this untoward calamity wasn't just an act of nature, it was itself the direct result of overt negligence, fundal pressure. On the contrary, by time the baby was found floating in the uterus, the defendants had been trying to deliver vaginally, watching the baby become hypoxic and ischemic, for at least an hour. They even went to the OR after seeing terminal bradychardia with a plan to continue pushing! This error alone requires a new trial. Plaintiff's counsel pointed out the false nature of Mr. Helms' characterization of the testimony, as well as his bizarre opening statement, and the court properly denied the directed verdict motion but the court then reverse itself, granted the motion. THE COURT: I'm going to grant defendants' motion for a directed verdict as to the issue of the C-section -- the possibility for the C-section causing the ultimate harm to the child and baby. I don't think there is sufficient evidence in the record to make that argument. I'm going to deny the defendants' motion with respect to a directed finding as to fundal pressure. It seems to me that there is sufficient evidence in the record for the plaintiff to make the argument that the fundal pressure wasn't indicated, never should have been done and was the proximate cause of the child's and mother's injuries. and ruled that it would give no issues instruction except for the sole deviation of fundal pressure. MR. GERACI: May I object before he starts? MR. GERACI: I have been patiently listening to both defense attorneys mischaracterize the entire evidence, in my opinion. I've heard the Court agreeing with them, however, that they are right. This case is about a continuum, but I did hear the Court also say that there is a continuum here. This case is about a series of deviations from the standard of care that occurred repetitively, repetitively. You could have said something at this time, you didn't. You could have said something at this time, you didn't. As far as the nurses, the nurses failed to advocate for the patient. We then turned to the doctor. Then, of course, the nurses failed to turn down the Pitocin. THE COURT: Hold on a second. Go on. MR. GERACI: -- that the deviations are set out clearly and then when we turn to the physician, that the physician deviations are stated clearly. That's why I went through them one by one by two all the way up to 20-some, and then I was very careful to ask the questions that Counsel have been saying now for the past half hour were never asked, which would be malpractice not to ask them and would result in a directed verdict. I listened to them saying these things with some bit of astonishment after we've 2054 been trying to get this case to the jury for some time. So I do believe that the Court's notes are correct. I do disagree with everything that Mr. Helms has been characterizing. He seems to understand my theory of the case very well now that he's been here for two weeks with you. MR. GERACI: It's been in black and white now, Judge, for four years. That's really not fair to take up the time saying that -- okay. You said hold on. MR. GERACI: I don't want to go off the record, Judge. THE COURT: I'm going to deny Dr. Socol's directed verdict at the close of plaintiffs' case. THE COURT: Please don't preach to me about medicine. MR. GERACI: -- in two seconds. THE COURT: I know that. I know that. This isn't the first bad baby case I've had. So don't tell me something I already know. That's been done way too many times. I want to know who is going to say -- or who said that her condition was caused by anything other than the membrane breaking? The trial court's statement indicated that it was substituting its personal knowledge for the consideration of the evidence by the jury. As can be seen by the following, Judge Hogan apparently has had only ONE “bad baby” case before him in his judicial career, although this listing from the Cook County Jury Verdict reporter could be erroneous. In addition, the trial court made numerous remarks in chambers to Larry Helms of Swanson Martin and Bell about a case involving Dr. Socol's defense firm, where the Appellate Court reversed the trial court's rulings in favor of Mr. Helm's firm. The trial court seemed to be overly concerned about that, and stated “I still think I was right”. The only appellate case that could apply is Nelson v. Upadhyaya, N.E.2d ––––, 2005 WL 2333831 Ill.App. 1 Dist., 2005. Sep 23, 2005 in which it was held that the trial court's allowing defendant's expert in medical malpractice action to testify concerning articles published after 1990 placed irrelevant and highly prejudicial evidence before the jury, requiring remand, where plaintiff's action arose from defendants' treatment of plaintiffs in 1990, even if defendants may have elicited testimony to show that standard of care continued to evolve through the 1990s. This was a case involving failure to prescribe prophylactic antibiotics. In any case, it is error for the court to profess extra-judicial knowledge of the facts of a case and base rulings on that knowledge. He can discuss his witnesses' testimony, but his witnesses didn't provide him -- his expert witnesses in my view did not provide the plaintiff with sufficient basis to make a connection between the baby's ultimate condition and the mother's ultimate condition and any deviations from the standard of care -- alleged deviations from the standard of care that occurred between 4:00 o'clock and 7:00 o'clock p.m. on the 25th of December 1999. MR. HELMS: Other than fundal pressure. THE COURT: Other than fundal pressure, right. So defendants' motion at the close of the evidence -- their joint motion is denied in part and granted in part. MR. QUANDT: Does that affect the issues instruction, then? THE COURT: Yes. It's got to be changed based on the Court's rulings. Plaintiffs' 8 will be refused based on the Court's earlier rulings, and it's to be resubmitted as 8A. 67. The trial court erred by failing to sustain plaintiff's objection, and admonish counsel, and instruct the jury to disregard, Larry Helm's histrionic closing arguments about his opinion that the trial was a travesty, and plaintiff counsel “shouldn't treat people like that” etc. etc. etc. A motion in limine against histrionics was in place, and such argument is blatantly impermissible and prejudicial. MR. HELMS: -- how they can sit here and listen to this sordid rewriting of what happened on Christmas Day in 1999 that casts them as these uncaring, inattentive nitwits. That maybe is where those human rules have been broken. They are people. You can do what you want to win a suit for somebody, but you don't need to and it is inexcusable to vilify them. THE COURT: Overruled. This is argument. MR. HELMS: It is inexcusable to treat people like that. Unless you've got real good evidence to do it, you don't call people contemptible. You just don't do that. You raise valid issues, you have them heard here, but you don't try to just skewer people. You don't. An unfortunate aspect of this system is they don't have any recourse. The very best that can happen to them is they can walk out of here without your saying they have to pay Ms. Lopez $31,000,000 or whatever that absurd figure was. That's the best they can do is walk out of here without a judgment. Nobody can give them back the time, the dignity. Nobody can do that, but you can say no to this travesty. This case is a disgrace. The one thing you can do to even begin to right it is just say no to any recovery. 67. The trial court erred by allowing Socol's attorney Larry Helms to argue that plaintiff failed to prove any deviation except application of fundal pressure was a proximate cause of injury. Judge Hogan will instruct you in the law applicable to this case based on what's come out of the evidence; and you will learn that out of all those so-called deviations, there is one claim left to come to you, one. All of those other things that were claimed to be wrong are not before you, not before you. That single issue is the claim that Dr. Chan, Dr. Socol and the nurses used fundal pressure, as a result of which they ruptured the uterus, as a result of which Giselle eventually died from the neurologic injuries and Ms. Lopez lost her uterus from the rupture itself. You've heard Nurse Mahlmeister and Dr. Gatewood testify to this giant litany of things they did all daylong that were deviations, thing after thing, rupturing the bag of waters. Dr. Jennifer Chan started committing malpractice , according to them, at 11:35 in the morning. That is gone. That's not here anymore. The Judge has ruled that out. That's not here. THE COURT: Sustained -- I mean, overruled. I think -- and I will argue to you -- that the argument that we heard this morning that Dr. Socol was using that evening now as 2223 an attempt to teach fundal pressure, something to sort of resurrect an arcane thing that he had never used in the past but somehow 25 years after that it stopped being used, that he was going to sort of resurrect that as a teaching example to those other residents and nurses is nothing more than an argument of desperation, an argument of desperation over the fact that 25 of the other 26 allegations are gone. It's an argument of desperation. 68. The trial court erred by preventing argument that uterine rupture is entirely avoidable if a c section is timely performed. MR. GERACI: Counsel had a book, but we don't have the degree. Unpreventable, unpreventable. That's not correct because if you don't do it, rupture is entirely preventable. MR. HELMS: Objection, no evidence of that. 69. The trial court erred by sustaining defense objection to stating the fetal heart rate was not flat when the tracing was discontinued before going to the operating room. R 2235. refusing to allow rebuttal that no evidence contrary to plaintiffs showed anything but a delay in delivery, that the jury should reject defense arguments, and by erroneously sustaining defense objections on rebuttal that encouraged Mr. Helms to interrupt rebuttal repeatedly to interfere with the argument. 70. The trial court erred in refusing to allow plaintiff to question Dr. Gatewood on redirect about the length of time to reach 6.95 ph, and what the pH must have been at birth, after defense counsel cross-examined Dr. Gatewood on that very subject and opened the door to it. Wherefore, plaintiffs move for a new trial.